The Evangelist Luke in that account of the Annunciation tells us that Mary was deeply disturbed by what she was hearing from the angel Gabriel, and was wondering what to make of it all. She also realised what the implications of being caught up in God’s plan would be for her personally, and did she have an inkling at that moment that her life would be changed for ever? 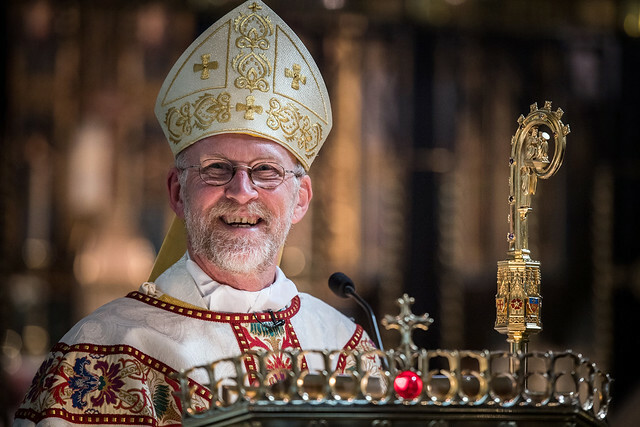 Mgr Paul, I am sure you too must have been disturbed when you first heard the news that you had been chosen to be the Seventh Bishop of the Diocese of Lancaster. In the intervening weeks you have been trying to come to terms with what Pope Francis was asking of you when appointing you as Bishop. Our Blessed Lady’s remarkable response, "I am the handmaid of the Lord, let what you have said be done to me" could only have come from a person of deep faith, of an openness to the will of God in her life. Mary was a daughter of Abraham, moulded and shaped in the rich faith and the promises made by God to her people Israel. Her devout family background and religious upbringing allowed her to make such a momentous decision and to give her assent to the Angel. Mgr. Paul, the Catholic faith of Lancashire in which you were nurtured and brought up through the example of your parents and family, enhanced by the priests and parishioners of St. Mary and St. Michael’s, Garstang, as well as your subsequent pastoral ministry both at home and abroad, enable you today to step forward courageously in faith and be ordained as Bishop. We celebrate in our liturgy today the awesome wonder and mystery of the Incarnation when the Son of God took flesh and dwelt among us. St Augustine of Hippo in his treatise on the Trinity comments that “When the Word became flesh a mystical and invisible anointing took place: human nature without any preceding merits of good works was joined to God the Word in the womb of the Virgin, so as to become a single person with him” (De Trinitate, 15:26, 46). Central to the rite of episcopal ordination is the anointing on the head with chrism, and consequently every bishop is specially commissioned to be a herald to the Church and the world of that mystical and invisible anointing of Christ in his Incarnation, of which Augustine so beautifully speaks. The letter to the Hebrews has God’s Son declare on entering the world, “Here I am! I am coming to obey your will.” Mgr. Paul, like that Master whom we all serve, you have come to this cathedral today to obey God’s will. So, in your response to God’s will, if we may be permitted to say so, you are in exalted company: that of the Incarnate Word made flesh, and the Blessed Virgin Mary who lived to do the will of God, and who gave birth to the Son of God. In the 8th century before Christ, at the time of the prophet Isaiah, we heard in our first reading how King Ahaz’s faith failed him at a time of national crisis, and he refused to ask the Lord for a sign. Mgr. Paul, you stand here today in the presence of this congregation, for your faith in God has not failed you! You will have many tasks and concerns to occupy you as Bishop, but remember that you will be ministering in faith to a people of faith. As their Chief Shepherd you will pass on what has come down to us from the Apostles, and at the heart of that treasure of faith is the cardinal truth that we recall in our liturgy today: that at a particular time and in a particular place the eternal Son and Word of God became a human being, and is indeed the Saviour of the world, the only name given to us under heaven by which we are to be saved, in the words of St. Peter. St. Augustine sounds a cautionary note for us bishops. When the congregation in the cathedral at Hippo were congratulating him on the anniversary of his episcopal ordination, he reminded them that individually each of them would have to answer before God for themselves, whereas he would have to answer not only for himself but for all those over whom he has been appointed shepherd. Mgr. Paul, draw comfort and reassurance today from the prayers and goodwill of so many of those here in this cathedral, throughout the diocese and beyond, as you make your own the words of Scripture, Lord, “Here I am! I am coming to obey your will!” Amen.